The yoga pose is not the goal. Becoming flexible or standing on our hands is not the goal. The goal is to create space where you were once stuck. To unveil layers of protection you’ve built around your heart. To appreciate your body and become aware of the mind and the noise it creates. To make peace with who you are. The goal is to love, well, you. Yoga has been around for about 5000 years, but for Westerners it’s a relatively new concept and mindset. Beyond just a highly-effective physical exercise, yoga is a process of exploration and discovery — for you, by you. If you allow it and if you’re dedicated to a yoga practice, it can become a way of life. The benefits of yoga create a shift in perspective that can be extremely powerful- it reminds you that you are enough. You have enough. There is nothing outside of you that will make you happier. When you look inward, you realize everything you need is already within you. Finding yoga was the best thing that ever happened to me. A regular yoga practice brought me to life, and showed me my light and purpose. It shook my soul and I can only hope to share this experience and feeling with others. The basic yoga principle is that the key to happiness resides within each of us. The practice of Yoga is simply the means by which we discover and draw upon this innate wisdom. What images come to mind when you hear the word yoga? There’s a good chance that what comes to your mind first is probably not the case. As a beginner, you may be surprised to learn that yoga poses (also known as asanas) are only a one piece of a yoga practice. Yoga gives you the experience of a deep peacefulness— feeling connected to yourself, others and nature. Yoga is simply a way of remembering our true nature which is essentially joyful and peaceful. Yoga is a process of deconstructing all the barriers we may have erected that prevent us from having an authentic connection with ourselves and the world. With Yoga, there is no reward to strive toward, because the practice is the reward. The physical practice and the types of yoga may evolve and change, the core philosophy does not. Pantajali, who is considered to be the father of yogic philosophy, developed— what are called the Eight Limbs of Yoga, the guiding principles of a yoga practice. Yama: Wishing no harm in word, thought or deed; being sincere, truthful and honest. Niama: How to act in the world. Asana: The physical postures of yoga practice, or the poses. Pranayama: Breathing practices defined as practices that help us to develop constancy in the movement of prana, life force or energy. Pratyhara: The practice of withdrawing the mind from the senses. Dharana: The ability to focus on one thing and let all else fall away. Samadhi: Moments of balance between mind and body— the divine union of the individual with the universe. Yoga requires dedication and a time commitment. To experience the amazing benefits of yoga, you’ll need to prioritize it in your schedule the best you can. Once you do that, choosing the time of day that fits your mood, getting the tools to do your practice, creating a space, and preparing the body are the next steps. Your body is unique. This doesn’t mean you should limit your yoga practice. Instead, tailor your practice to fully support your needs. One of the best ways to prepare for a fulfilling yoga practice is to change your mind-set. If you begin with the attitude that you’re too busy, too inflexible, or just don’t see the point, you’re going to have a difficult time incorporating yoga consistently in your life. Remember that yoga is not a task or goal or even a means of “self-improvement.” Let go of any expectations about the outcome. Instead, approach it with an open mind and total acceptance of the now. True yoga is the SIMPLE means by which we radically WAKE UP to the magnificence of who we already are. Once your mind is open and you feel ready, find a time to practice consistently. Traditionally yogis practiced around sunrise and sunset because those were viewed as the most calm and serene times of day. Find a time and commit to rolling our your mat at the same time each day. While nothing is required to practice yoga except having a mind and a body, and being able to breathe, there are some tools that will help you in the practice. Yoga mat: The mat is key because it prevents slipping and cares a solid footing for the poses. When practicing in large groups it also becomes your own sacred space. Look for a mat that has a bit of a grip to it to prevent your hands and feet from sliding on the mat. Mats very from very thin to very thick. Thin mats help you feel more connected to the ground, while thick mats offer more cushion. Thick mats tend to offer less stability and balance due to the, albeit, small space between you and the ground. Yoga blocks: Blocks can be used to make the poses more accessible by helping you adapt the poses to your own body. For example, if your hamstrings are tight, you can use blocks to bring the ground closer to you when bending forward. Yoga strap: Yoga straps can be used for passive stretching, active poses and to aid in more advanced postures that require “binding,” where the hands are joined behind the back. When looking for a strap look for one with a metal or plastic closure on the end so that the strap can be made into an adjustable loop. Bolster: A bolster is great for meditating or sitting or lying down for extended periods of time. Although there are a variety of shapes, bolsters are typically rectangular and feel like a firm, sturdy pillow. They’re wonderful props for restorative yoga and make great gifts for prenatal yoga. Use them to support seated and supine poses for more ease and comfort. Blanket: Blankets can be used as a prop to help you get into poses, to pad your needs or to lift your seat. They can also be used for warmth at the end of the practice during savasana. Most yoga blankets are fairly stiff and durable and can be stacked or folded for varying heights. Joseph Campbell said, “Your sacred space is where you can find yourself over and over again.” Since yoga is a practice of discovering and honoring your true self, it’s important to create a regular space in your home to practice yoga. Choose somewhere that can be a refuse from distractions of the outside world. Look for a place where you can find quiet and allows for enough room to move easily. Then equip your room with the essentials of your practice as well as candles, essential oil diffuser, incense, pillows— or anything else that makes the space comfortable and special. The dynamic physically demanding practice synchronizes breath and movement to produce an internal heat designed to purify the body. This style is great for building core strength and toning the body. This set series of 26 postures and two breathing exercise is done in high heat for 90 minutes. Bikram Yoga’s specific yoga sequence of poses is staid to systematically work every part of the body, increasing the flow of fresh oxygen rich blood, while the heat serves to speed detoxification. Ishta Yoga integrates the ancient sciences of Hatha Yoga, Ayurveda and Tantra. It’s breath-centered alignment-oriented practice combines elements Iyengar Yoga and Ashtanga Yoga and incorporate subtle-energy techniques like mantra and visualization meditations to expand awareness and generate emotional well being. By paying close attention to anatomical details and the alignment of each posture, Ivengar Yoga is the practice of precision. Poses are held for a long periods and often modified with props. This method is designed to systematically cultivate strength, flexibility, stability, and awareness. This fitness-based vinyasa practice is an offshoot of Ashtanga, and has many of the same qualities and benefits, including building internal heat, increased stamina, strength and flexibility, as well as stress reduction. Teachers design their own sequences, while students synchronize breath with the movement. Restorative yoga typically involves only five or six poses each class, supported by props that allow you to completely relax and rest. Held for 5 minutes or more, restorative poses include light twists, seated forward folds, and gentle backbends. This practice is designed to help you sit longer, and more comfortably, in meditation by stretching connective tissue around the joint. A passive practice, Yin Yoga involves variations of seated and supine poses held for 3 to 5 minutes, accessing deeper layers of fascia tissue. Leave your mat out and unrolled or place your mat out at night as a gentle reminder to begin your practice. Schedule your practice as an appointment in your calendar. Sign up for a recurring class at your local yoga studio so that you commit to going once or twice per week. Set an alarm on your phone. Write a nice message to yourself with that alarm that tells you it’s time to do for a little “me” time. Don’t hit snooze. Set a goal to practice once a week for eight weeks, or whatever seems doable for you. When you reach that goal, reward yourself. Buy a new yoga mat or yoga clothes. Do something that makes you happy. Find a quote or mantra, or create one of your own. Write it down in your journal, or frame it and place it next to your bed or in your yoga space. Let it inspire you to dedicate time to your practice. Begin in a neutral tabletop position with hands under shoulders and knees under hips. On an inhale breath, soften the belly towards the floor, shift your gaze up to match the curve of your spine and pull the heart forward. From your neutral tabletop position. Spread the fingers wide and use the whole surface area of your hand including your five finger pads and emphasise pressing the index and thumb pads into the mat. Curl your toes under, exhale and lift your hips to the sky. Stretch your heels onto or down toward the floor. With bent knees or straighten your knees, but be sure not to lock them. Roll the upper thighs inward slightly. Widen your shoulder blades and draw them toward the tailbone. Keep the head between the upper arms. Melt the chest towards your thighs and hug in the belly. Start in Downward-Facing Dog. On the exhale step your right foot forward between your hands, aligning your knee over the heel. Keep your left leg strong and firm. On the inhale raise your torso upright and sweep your arms wide to the sides and raise them above your head. Palms facing inward. Look up toward your thumbs. Lengthen your tailbone toward the floor and reach back through your left heel. Stand with your feet together, hands on your hips. Keep your weight evenly distributed between each leg. Exhale as you bend your knees, sending your hips behind you as you sit on an imaginary chair. Engage your legs and hips by gently pressing the legs toward each other and hugging the hips toward your midline. Raise your arms overhead, with your palms facing each other. Externally rotating the shoulders, and widening across the chest. To exit the posture, push firmly through your feet to extend your legs, and then release your arms down by your sides. From Warrior II, inhale to reach your front fingertips slightly forward on the exhale glide them back overhead. The back fingertips rest on the back leg. Step your feet about 3 to 4 feet apart, with your hands on your hips. Lift up tall through your whole torso and, hinging at the hips, fold slowly over your legs. Place your hands flat on the floor, shoulder-width apart; begin to stretch your torso forward. Lengthen your entire spine from your sitting bones to the crown of your head. Fold deeper, bringing your head toward the floor. To exit the pose, inhaling, press into the outsides of both feet, slowly lift up to standing; then exhale. 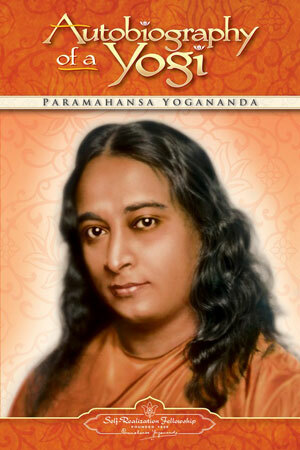 Autobiography of a Yogi by Paramhansa Yogananda: The classic spiritual memoir, first published in 1946, still resonates with practitioners today who are looking for self-realization. 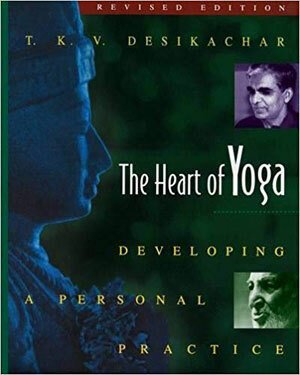 The Heart of Yoga: Developing a Personal Practice by T.K.V. Desikachar: A clear and rewarding introduction to what “yoga” means beyond the practice of asana, written in straight-forward prose that—as the title suggests—speaks to the heart. 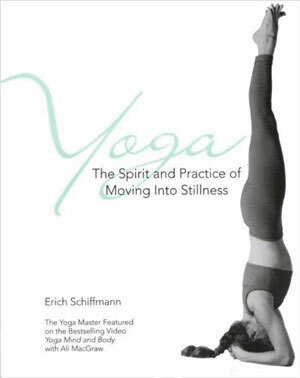 Yoga: The Spirit and Practice of Moving into Stillness by Erich Schiffmann: A guide to 45 asanas, with thorough instructions. This book is filled with the wise advice of a master teacher yet points the reader toward the wisdom of the ultimate guru: the Self. 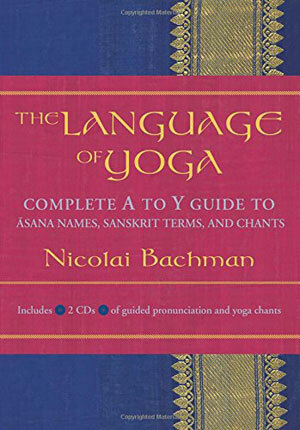 The Language of Yoga: Complete A to Y Guide to Asana Names, Sanskrit Terms, and Chants by Nicolai Bachman: A guide to Sanskrit words commonly used in yoga classes, with an emphasis on pose names. An accompanying CD offers correct pronunciations. 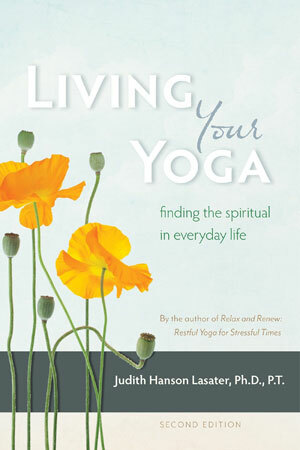 Living Your Yoga: Finding the Spiritual in Everyday Life by Judith Hanson Lasater. Lasater stretches the meaning of yoga beyond its familiar poses and breathing techniques to include the events of daily life—all of them—as ways to practice. 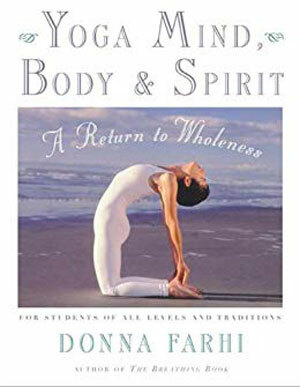 Yoga Mind, Body & Spirit – A Return to Wholeness by Donna Farhi: This excellent book offers easy-to-follow techniques that help people find inner peace and the beauty in life. This holistic guide to yoga is a user-friendly book with 240 clear illustrations to help instruct the reader. 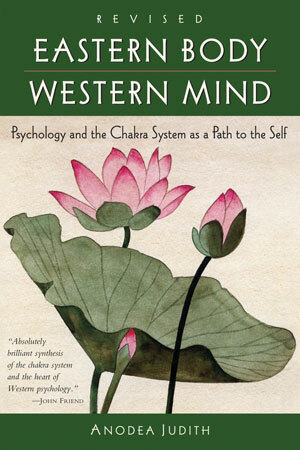 Eastern Body Western Mind by Anodea Judith: Arranged schematically, the book uses the inherent structure of the chakra system as a map upon which to chart our Western understanding of individual development. Each chapter focuses on a single chakra, starting with a description of its characteristics and then exploring its particular childhood developmental patterns, traumas and abuses, and how to heal and maintain balance. 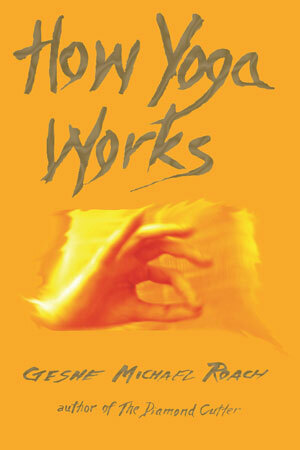 How Yoga Works by Michael Roach and Christie McNally: Special Limited Edition of the best selling yoga book about The secrets of how yoga works to make us truly whole are revealed here in a delightful story based on how these precious teachings reached Tibet form their home in India, over a thousand years ago. 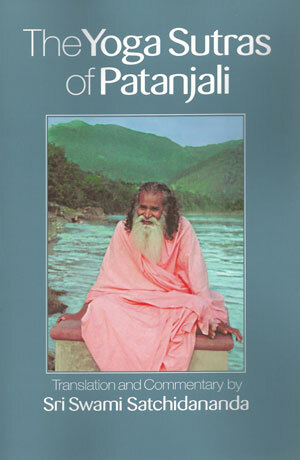 The Yoga-Sutra of Patanjali: This valuable book provides a complete manual for the study and practice of Raja Yoga, the path of concentration and meditation. This new edition of these timeless teachings is a treasure to be read and referred to again and again by seekers treading the spiritual path. The classic Sutras (thought-threads), at least 4,000 years old, cover the yogic teachings on ethics, meditation, and physical postures, and provide directions for dealing with situations in daily life. a road map of human consciousness— Sri Swamiji offers practical advice based on his own experience for mastering the mind and achieving physical, mental and emotional harmony. 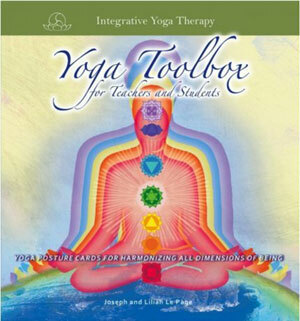 Yoga Toolbox for Teachers and Students by Joseph Le Page and Lilian Le Page. This book contains 90 colorfully illustrated and laminated cards in a vinyl binder. These cards are designed to support your Yoga teaching and practice by showing how important elements of yoga physiology, psychology, and philosophy relate to the practice of the postures for healing and transformation. If you are at all intimidated by the thought of moving your practice out of your living room and into the yoga studio, here’s a guide for how to proceed and what to expect when you make it to the shala (studio) for the very first time. “Props” are the tools you can use to help accommodate for anatomical differences in your poses (i.e., arm length, flexibility, etc. ), and include blocks (foam or cork), blankets, straps or belts, and bolsters(pillows). If you attend a class that provides props, simply ask the teacher which props you should get today, or see what everyone else has and get the same ones. If the teacher knows you are new to the practice, he/she should give you some guidance on how to use them, but the basic rule is that they should be used to bring more stability and easefulness to your poses.